Back in high school I worked at an ice cream shop. We had a bunch of different toppings available for sundaes including butterscotch and caramel. The interesting part was that those two flavors were actually the same thing. It even said butterscotch/caramel on the package. Nobody ever complained. If they were expecting caramel, they tasted caramel. If they expected butterscotch, they tasted butterscotch. Heh, we had something similar at this bakery I worked at. All year round we’d sell pumpkin pies, but around the fall season we’d label half of them as squash ( which isn’t really a lie, pumpkins are a -kind- of squash iirc ). And we’d get people coming in telling us about how our squash pies were SO much better than the pumpkin and we should sell it year round. People are weird. Interesting. I like Butterscotch, but I don’t like caramel… then again, I don’t like ice cream, so maybe I will never be in a situation like that. Actually, butterscotch isn’t caramel, What he was saying was that THEIR butterscotch is the same as their caramel. But the packaging said “butterscotch and caramel” so there is a difference. Butterscotch and caramel have the exact same ingredients in them. The primary difference is the cooking process – in butterscotch, the sugar and cream are brought to a boil at the same time, whereas in caramel the cream is added later. Funny thing is, Center and Plopp are actually made by the very same manufacturer! 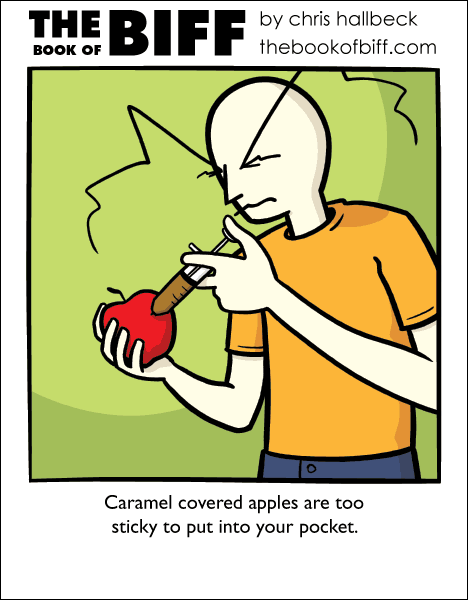 i was just thinking about a caramel injected apple earlier today. did you read my mind Chris? No, this comic is from yesterday. Sounds like kingklash read my mind, because was just thinking about the way they price car parts. There’s actually a special catalogue that lists equivalent parts, so when two cars use the same part, you can ask for the one for the cheaper car. I got to the page and at first it looked like he was holding a bong. I realize the stress of being Biff is pretty intense, but I didn’t know he’d turned to narcotics! I had to go look it up. The biggest difference between butterscotch and caramel is butterscotch uses BROWN sugar. So, yeah, as an ice cream topping, there’s really not a noticeable difference.